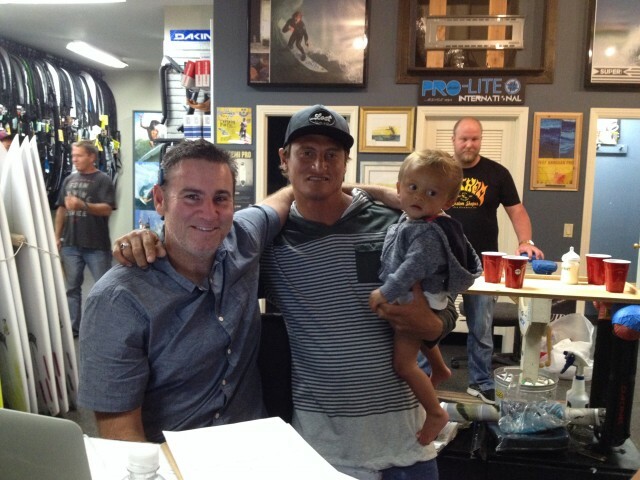 4/28/14: Shapers Night at Surfride in Oceanside was blast last Friday. Wardo actually showed, Biolos took custom orders, everyone drank a bunch of beers, ate a bunch of tacos and we took a bunch of pictures. Special thanks to SURFRIDE for hosting the event. Biolos taking custom orders one on one. Stoked groms with some free …Lost swag. The board room at Surfride in Oceanside was where it all took place. …Lost clothing rack next to a new C3 “Cork” surfboard. Recent ResinWorks boards on display. He’s happy with his new …Lost “Big Mouth” tie dye. …Lost co-founder Mike Reola and Chris Ward. Chris Ward signing posters for the kids. Matt “Mayhem” Biolos filling out custom order forms. Big Shaw was serving them up all night. …Lost’s Rick Downes, Joe Alani and Johnny Thunderfoot. Happy campers with their Wardo signed posters and other …Lost goodies. We had tacos being served out front for dinner. Wardo wondering why he doesn’t have one of these cork boards already. …Lost and Surfride team rider Darrell Goodrum was on a surf trip but he showed up in the light box. Wardo can eat 10 of these in one sitting when on a Baja road trip. We assume he fills up in case anything goes wrong. One on one with Biolos and his computer of shaping secrets. Chris signing a poster for his long lost Latino half brother EdWardo. Looks like he’s got the same problem of losing stuff that Chris does. Even Biolos got into the poster signing act. Chris finally brought us a trade-in. He’s been holding onto this one since 1996. CJ Ward testing out dad’s …Lost board from 1996. Michele says he’s a goofy foot but Chris is still hoping for a regular. The upstairs of Surfride in Oceanside. Doug Van Mierlo sampling some of Coronado Brewing Co’s fine product. Team guy Rick Downes explaining whose boards Wardo rides. Close inspection of the RV. Employees drinking on the job. Coral helping pick out logos. She got accepted to Berkley as we were throwing the event. Checking the dims on a Taj Burrow “Exacta” model. Matt “Mayhem” Biolos with Chris and CJ Ward.